Twenty-one years ago – April 10, 1998, to be exact – the DUP dismissed the Good Friday Agreement as a ‘betrayal’, a ‘treacherous act’ and a ‘one-way ticket to a united Ireland’. Their collective abuse of the agreement, the UUP and Trimble would have filled a lexicon; and yet, within a relatively short time (the 2001 local government elections) the language had shifted from the outright hostile to the much more measured approach of, ‘A vote for the DUP will be taken for strong leadership to halt the concessions. You have the opportunity to vote for a better way forward’. And soon afterwards the language had shifted again, to a ‘better deal’ and ‘fairer deal’. It’s what the DUP do. They’ve always been much more flexible than their opponents give them credit for; always able to bridge a Grand Canyon gulf between one position and another. It’s a political talent they share with Sinn Fein. Plant the seeds of a new strategy; warm up the electoral base; present yourself as the only party which can be trusted to take risks; and then do what was once thought to be the unthinkable. It’s how they ended up in government with Sinn Fein in 2007. It’s how they ended up in a deal with the Conservatives in 2017, even though they had mocked the UUP’s political/electoral pact with David Cameron a few years earlier. As I say, their opponents accuse them of ‘making it up as they go along’ and of not having a thought-through strategy. But they usually do. Fair enough, often the strategy may not be much more sophisticated than naked self-preservation (or, in the case of Brexit, getting themselves out of a hole they didn’t expect to be in because Leave squeaked a victory), but they think it through and always have other options to hand. Bear in mind, too, Sinn Fein – normally very Eurosceptic – didn’t expect Leave to win, either; but as soon as it did they recalibrated their strategy and prioritised a speeded-up unity process, a border poll and a reach-out to ‘soft’ nationalists and unionists above every other policy and strategy. The DUP’s immediate response to the result was a joint letter from Arlene Foster and Martin McGuinness in the summer of 2016, couched in conciliatory language and setting out how the NI Executive would work together to reflect the result while also recognising the special circumstances in Northern Ireland. That approach made sense. But within six months the Executive had collapsed and the priorities of the DUP and Sinn Fein shifted in different directions; with the DUP opting for a king-maker role with Theresa May, while Sinn Fein continued to play – understandable in the circumstances – the England’s Misfortune Is Ireland’s Opportunity card. 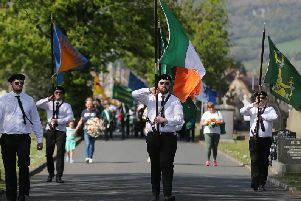 The dynamics shifted again in December 2017 when the prime minister, much to the surprise of both the Irish government and the DUP – albeit for entirely different reasons – endorsed what became known as the backstop solution. It was always going to be unacceptable to the DUP and to broader unionism. It may have looked good on paper, the ‘best of both worlds’ as some described it, but anything which held out the prospect of NI treated so differently from the rest of the UK was always a non-runner. It was a form of potential partition as unacceptable to unionists as the 1921 partition was and is to nationalists. The DUP responded by moving closer to Boris Johnson, Jacob Rees-Mogg and the ERG. The move concerned me. But since the Irish government, Brussels, Sinn Fein, the SDLP and two-thirds of Tory MPs supported the backstop, there probably wasn’t anywhere else for the DUP to go. And that’s where we are right now. The DUP cannot and will not vote for the backstop in its present form. Anyone who thought otherwise doesn’t understand the DUP. No unionist party could vote for it. But it’s also a mistake, as I have pointed out all along, too, to think that just because the DUP votes against the backstop it means that it favours a hard Brexit, a hard border, or no deal at all. It doesn’t. What political/electoral purpose is served for the DUP by any of those outcomes? Direct rule would do them no favours, either; particularly if it came in a form in which the Irish government would have a greater say than before. Also, although whisper it, the DUP needs the Assembly up and running again. Shortly after the referendum I noted that the DUP thought there was nothing to lose by backing Leave; ‘assuming that Remain would win and that life would carry on much as before.’ They would still like life to carry on much as before. So they wouldn’t have any problem whatsoever with the softest-of-soft Brexits, or no Brexit at all. (And please, can we all just forget the stuff coming from Sammy and Ian Jnr; they have lost the run of themselves and I’d like to think they’ll come to their senses now that so many of their new-found friends in ERG have so brazenly shafted them). An extension would suit the DUP very nicely. Softly-softly suits them, too. That’s why they didn’t buckle on any of the votes last week. They played the numbers game. That’s what they’ve been doing since December 2017. It’s what they’ll continue to do to ensure the best landing for the Union. Selling a soft Brexit/no Brexit would be embarrassing for them; but they’d get over it. Ending with the backstop in its present form would be politically/psychologically devastating for them.